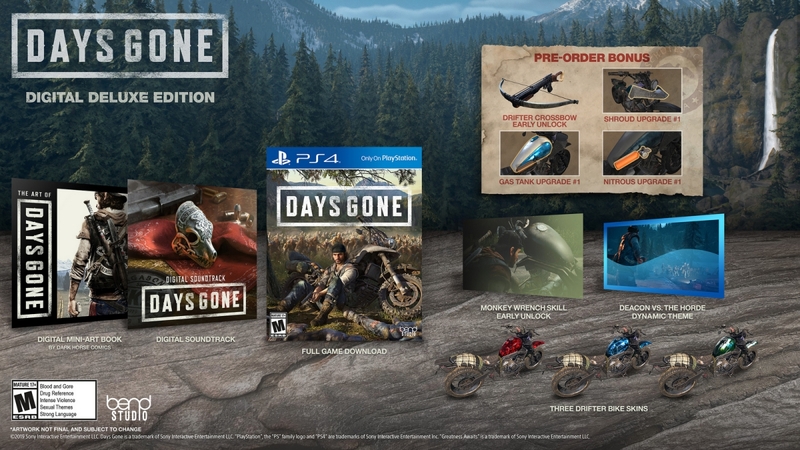 With a few months left until launch, Sony and Bend Studio have revealed preorder bonuses and two special editions for Days Gone. Preordering at any retailer will net consumers a voucher on launch day for the Drifter Crossbow and upgrades for Deacon’s bike, which include Nitrous, a Gas Tank, and Shroud. PlayStation Store preorders will grant buyers access to a Days Gone Sawmill Dynamic Theme. Players can download the theme after preordering. Bike upgrades seem specifically useful. The Shroud upgrade provides additional protection from bullets and freakers. A full tank of gas comes with the Gas Tank upgrade. As expected, the Nitrous upgrade offers the bike a speed boost. The reveal for the special editions doesn’t feature a trailer, but there’s plenty of information about the contents available in each one. Days Gone is receiving two special editions, a Digital Deluxe Edition and a Collector’s Edition. With the Digital Deluxe Edition, players will unlock three drifter bike skins, an early skill unlock and theme, a digital mini art book, and a digital soundtrack. This edition is currently available to preorder on the PlayStation Store and costs $69.99. For the Collector’s Edition, players will get all of the content featured in the Digital Deluxe Edition. It also includes a Collector’s Edition Statue, six pins, four decals, a set of patches, a Steel Book, physical soundtrack, and 48-page mini-art book from Dark Horse Comics. This edition costs $139.99 and is available to preorder at retailers now. Days Gone was recently delayed out of its February 2019 release date. The title will now hit the PlayStation 4 on April 26, 2019.